What are Airborne Infection Isolation Rooms? 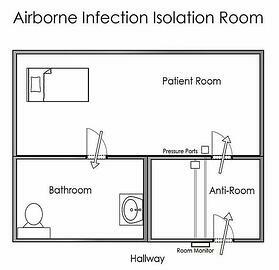 Airborne Infection Isolation (AII) rooms, commonly called negative pressure rooms, are single-occupancy patient care spaces designed to isolate airborne pathogens to a safe containment area. AII rooms are a specialized application of a hospital’s HVAC system, where the airflow supplied into the room is balanced with exhaust airflow to create at least -0.01” WC negative differential pressure with respect to an adjacent space, usually the hallway or an anteroom. In simple terms, this provides a gentle flow of air under a closed doorway and into the room so that no airborne particulates escape into nursing staff or public areas. Exhaust from these rooms is not recirculated in the HVAC system. Instead, exhaust air typically moves in dedicated ductwork to ventilation stacks on the rooftop, where atmospheric air provides sufficient dilution to make the resulting air safe. The use of AII rooms is required by the Centers for Disease Control and Prevention (CDC) as a means to protect the public from the spread of disease. Patients immediately confined to AII rooms usually have illnesses such as tuberculosis, SARS, H5N1, or coughing conditions that may pose a risk to hospital staff. 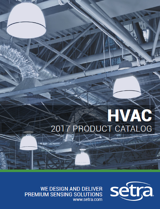 In response to the CDC’s AII room mandate, the American Society of Heating, Refrigerating, and Air-Conditioning Engineers (ASHRAE) outlines how airflow should be designed in these spaces. ASHRAE Standard 170 specifies air change rates, pressure requirements, temperature guidance, and filtration conditions. For AII rooms, the most efficient way to measure, monitor, and alarm on room pressure conditions is using a monitor that can support multiple rooms, like Setra FLEX. CLICK HERE to view more information on the full line of pressure monitors from Setra.